SAN FRANCISCO — Visa Inc. launched Visa Developer on Thursday, signalling a shift to a new model of doing business on an open platform and making a series of new technology services and capabilities available to its existing partners and new ones alike. While the owner of the world’s largest payments processing network in VisaNet isn’t opening up access to its core backbone, it is releasing 155 APIs previously only available to its internal developers. Services such as account holder identification, person-to-person payments, mobile locaters, a checkout system for mobile apps, and more will be made available as REST architecture APIs with a PHP interface. Visa is doing this now because the consumer buying experience is changing, said Charlie Scharf, CEO of Visa. Visa has more than 2.6 billion credit and debit cards in the market and processed $7 billion on its network in 2015. By opening up its technology to developers with no charge, it hopes to see the volume of transactions continue to grow. 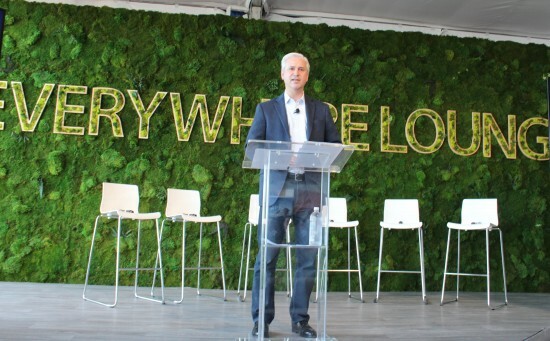 Visa executives and a few early partners in its platform spoke about the program at Visa’s San Francisco headquarters. Charlie Scharf, CEO of Visa, announces Visa Developer. Canada is expected to be one of the top user markets for Visa Developer, Jamison says. The card issuer is in talks with several Canadian banks on a trial basis, including TD Bank, Scotiabank, and RBC. Canada currently accounts for about four per cent of Visa’s payments volume. TD has been developing a few use cases with Visa’s new APIs as part of a pilot test, says Vipul Lalka, associate vice-president and head of North American mobile banking at TD Bank Group. It hasn’t planned to release them to a live app yet, but Visa’s new capabilities could allow TD Visa cardholders to restrict where their credit card can be used based on geographic location, or to set a spending limit on their cards. Developers can make use of Visa’s sandbox environment and a set of test data to work on their apps. When they want to publish the apps and go live, they need to apply for approval from Visa’s team – similar to how Apple developers must receive a blessing from Silicon Valley before hitting the App Store. Visa Developer is about creating the potential for Visa to reach the billions of Internet-connected devices that could be a potential payments interface, says Derek Colfer, head of technology and innovation at Visa Canada.